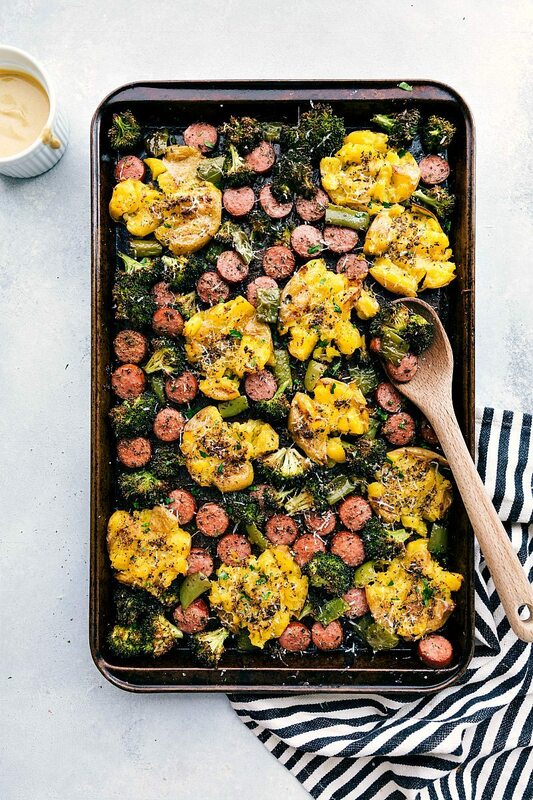 Say hello to ANOTHER sheet pan sausage and veggies meal 🙂 Yes, this is the 5th version of the same kind of concept (roasted veggies, sausage, delicious herbs) to hit my website, but I promise each “version” is unique enough to share and this one is no exception. Today we’re adding crispy parmesan smashed potatoes AND a delicious dijonnaise to the mix and I am so excited for you all to give this recipe a go! If you’ve never had the chance to try smashed potatoes, you are in for a treat. Smashed potatoes are soft and pillowy on the inside with a crispy outside that’s been covered in a garlicky-herb-butter mixture, roasted to perfection, and topped with parmesan cheese. While the smashed potatoes keep this meal from truly being a “one pan” meal (you’ll use a pot), they are 100% worth it. We’ve become addicted to these crispy smashed potatoes and they really aren’t that much more work. How do you make crispy smashed potatoes? You start by boiling the potatoes in salted water until they are completely tender. You’ll know they’re tender if you can easily pierce the potatoes with a fork or skewer. You’ll want to make sure the potatoes are completely tender, but not overcooked. The total time will depend on the size of your potatoes, but for smaller sized potatoes you’re looking at 20-25 minutes. Once the potatoes are tender, you’ll drain them and then I like to let them dry for a few minutes. This helps ensure they are extra crispy! 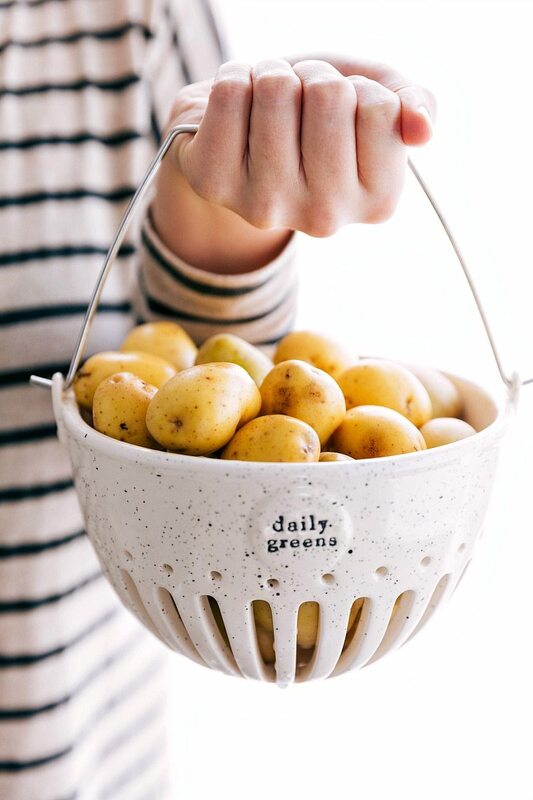 Now comes the fun part 🙂 Grab a large fork or a potato masher and gently flatten the potatoes while keeping them in one piece. If you are too aggressive with mashing the potatoes down you’ll end up with mashed potatoes instead of smashed potatoes. You want to aim to flatten the potatoes to the thickness of about 1/2 inch. Next, you’ll add some herbs (the same spice mix you’re tossing the sausage and veggies with! ), garlic, and butter. Finally, you’ll add a drizzle of olive oil and these potatoes are ready to roast (along with everything else!) Why do we add butter AND oil? Basically the butter is going to give the potatoes a really delicious flavor and the oil is going to help them crisp up better. As far as the rest of the dish, it’s a pretty standard and easy to prepare meal. 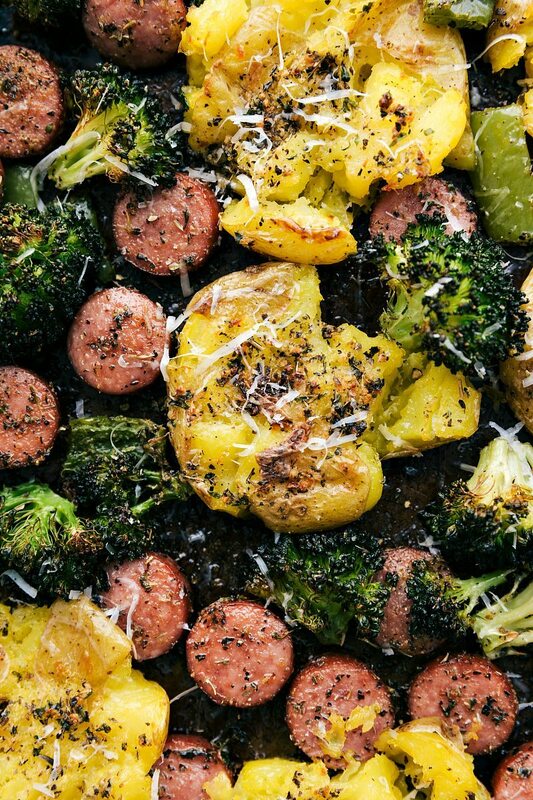 You’ll chop the veggies, coin the sausage, and toss it all in a delicious seasoning mix plus some olive oil. This dish comes together really nicely because the smashed potatoes, veggies, and sausage all cook together at the same time. You can prepare the rest of the dish while the potatoes are boiling. Once it’s in the oven, you can prepare the dijonaise if desired. This dijonaise is super easy to prepare and we LOVE it with the veggies and sausage. If you are a big fan of dijon mustard you will love this sauce! If you aren’t, I’d skip the sauce 🙂 You can also always add more mayo for a less intense mustard flavor. I hope you give this recipe a try and love it! Drain the potatoes and let them stand and fully dry for a few minutes. 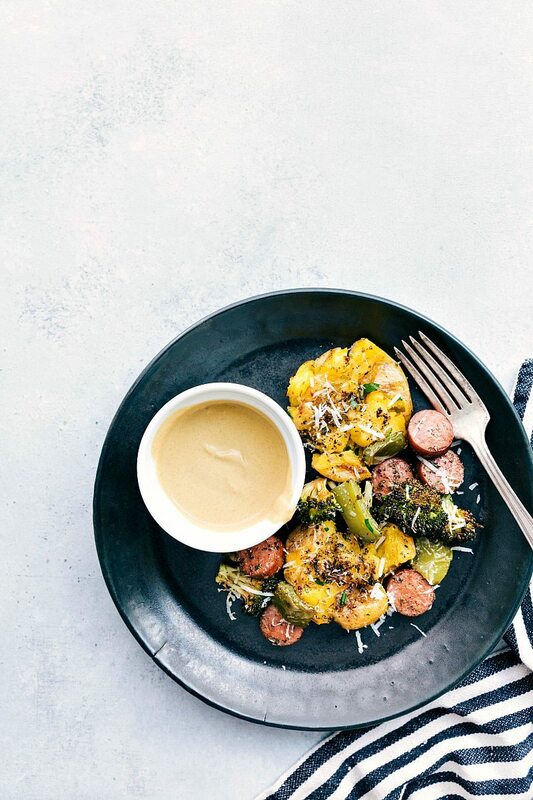 Meanwhile, prepare the other ingredients: coin the sausage, chop the broccoli into florets, and remove the stem and seeds from the pepper and then coarsely chop. 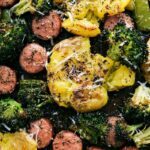 Add the coined sausage, broccoli florets, and pepper to one half of a large sheet pan. On the other half of the sheet pan add the potatoes. Using a large fork or potato masher, gently press into the potatoes being careful to keep them in one place and to not fully mash them. Next prepare the seasoning mix. Combine the dried basil, dried oregano, dried parsley, garlic powder, onion powder, dried thyme, salt, and pepper. 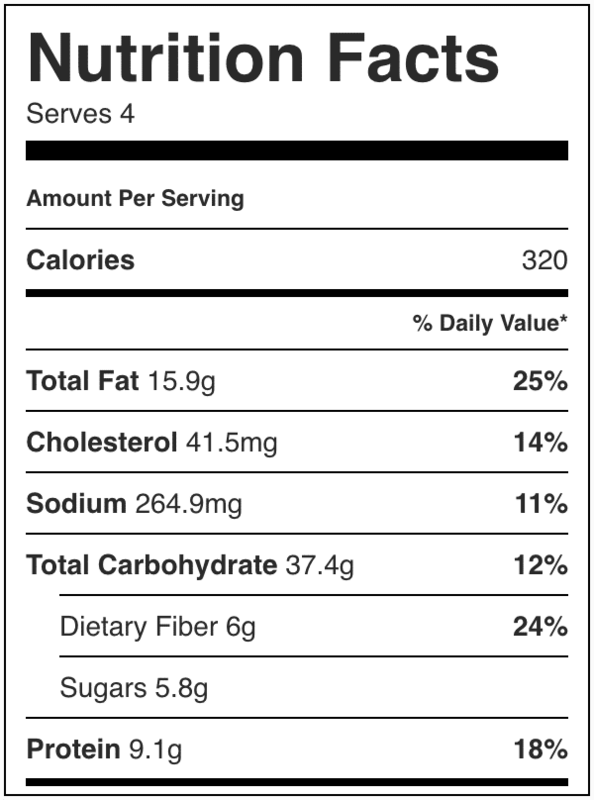 (I use about 1/8 teaspoon pepper and 1/2 teaspoon salt). Stir to combine. Combine the 3 tablespoons melted butter, garlic, and 2 teaspoons of the seasoning mix in a small bowl. Stir and then divide evenly on top of each smashed potato. Toss the remaining seasoning mix and 2 and 1/2 tablespoons olive oil with the sausage and veggies. Drizzle the last 1 tablespoon olive oil evenly over the potatoes. Toss the sausage and veggies together. Bake for 25-30 minutes or until veggies are tender and roasted and the potatoes are crispy. If desired, broil for 2-3 minutes (watching carefully) on High. Sprinkle with finely chopped parsley and parmesan cheese. Enjoy with sauce if desired. For the sauce, whisk all of the ingredients together. Season with salt and pepper to taste.